Coyote Point Yacht Club, located at Coyote Point Marina/Park in San Mateo, provides an unique venue for cruise-ins and party events. 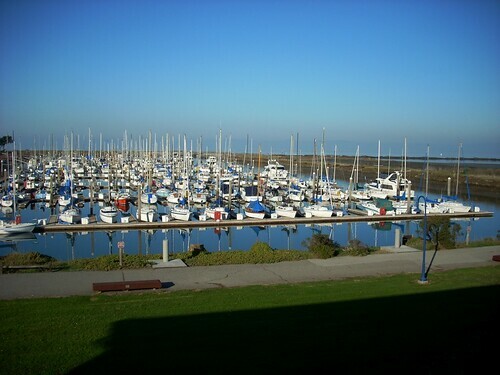 In addition to our club and the park, the public Poplar Creek Golf course and the delightful family-oriented Coyote Point Museum are within walking distance from the docks. The SF Bay Trail is just outside our door, offering a scenic path for walking and/or biking. Views of San Francisco, the East Bay and the San Mateo Bridge give our members and guests a pretty setting for events in the clubhouse and outdoor activities in our backyard. Cruise in on your own or with a reciprocal club group. Our Port Captain will coordinate your club’s cruise in and work with you to make your cruise a fun and successful event for your members. Please e-mail portcaptain@cpyc.com to make your reservations for your next cruise in event! CPYC provides guest dock facilities that include electrical hookup, water and Wi-Fi for visiting yachtsmen and yachtswomen. Come for the day or stay overnight. Fly your Burgee & members of Reciprocal clubs pay $1 per foot per night dock fee. Not a member of any club ? That’s ok, come dock and visit. More than a 2-night stay needs to be arranged with the Port Captain. Non-reciprocal clubs should call ahead for pricing and availability. There is a refundable deposit of $20.00 for the dock and club keys. Shower facilities are available in the clubhouse. Lunch and Dinner are served on Fridays. Free Wi-Fi is available throughout the club and ample parking just outside our building is available for land cruise in participants. The club has an upstairs Commodore’s Room with bar and lounge and outdoor deck. The downstairs Regatta Room has access to the backyard and BBQs. There is a large screen television in the Regatta Room along with a pool table and basic kitchen facilities. I will forward you information to our port captain. We would love to have you visit the club.